Designed for materials to about 1-3/4" thick. Diamond Drill Bit Sizes from 1/8" to 5"
DiamondSure brand Pro-Sintered Diamond Drill Bits are also know as Sintered Diamond Core Drill Bits or Sintered Diamond Hole Saws. These are professional quality, heavy-duty diamond drill bits designed for use on ceramic tile, porcelain tile, limestone, sandstone, marble, granite, quartz and other stone, plus bricks, masonry, concrete block, and concrete. Water must be used for lubrication. tip of bit of the 2" size bit. 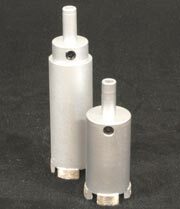 Sintered diamond drill bits have the diamonds embedded into the metal of the drill bit tip rather than merely "bonded" to the tip as with bonded diamond drill bits. As the tip wears down on a sintered diamond drill bit, new diamonds come to the surface. The tip sidewall of DiamondSure Pro-Sintered Diamond Drill Bits is 2mm thick on the smaller size bits (1" and below) and increases to 2.5mm to 3mm thick on larger size bits. 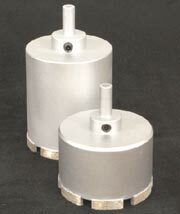 Sintered diamond drill bits are heavy-duty bits designed for long life. 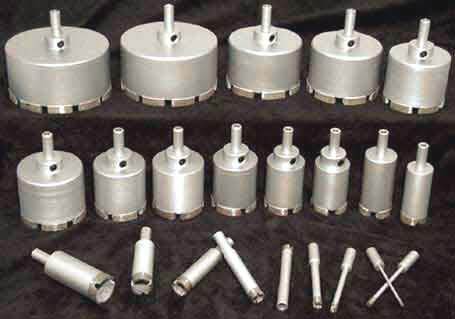 Generally, sintered bits will have a long life of 20 to 30 or more times the life of a bonded diamond drill bit, if used properly. The heavy-duty design provides long life when drilling in very hard materials such as porcelain tile, granite and hard stones. However, there are some disadvantages. 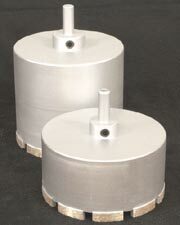 Sintered bits are more costly than bonded diamond bits and the thick heavy-duty tip causes them to drill more slowly than thin-wall bonded diamond drill bits. 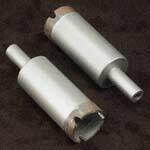 However, for continued drilling in hard mateirals, the higher cost of the Sintered bits is well worth bcause of the longer life. 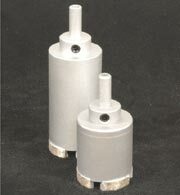 Diamond drill bits are easy to use, but there are many drilling techniques that are different from standard steel-bit drilling. 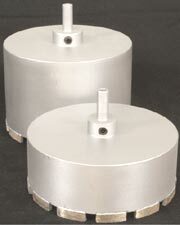 Diamond drill bit usage can also vary depending upon the diamond drill bit type and the specific manufacturer. To assist our customers, we have compiled a detailed Drilling Tips & Techniques section. Because diamond drill bits are used to drill in extremely hard materials, it is very important to use proper drill pressure to keep from overheating the drill bit. Excessive pressure is merely converted to heat energy and can burn up a bit or cause heat fractures in the material being drilled. * WARNING: Drill press arm gears leverage hand pressure by a factor of about 6 to 8. So 2 lbs of hand pressure on the drill press arm can apply up to 16 lbs of pressure to the drill head. Water must be used for lubrication. There are many ways to lubricate the drilling, as explained in our Drilling Tips & Techniques page. One of the most effective methods and the one used by most professionals, is to use a Water Swivel, also know as a Water Feed or a Water Feed System. with optional center pilot bit. Starting a core drill / hole saw style drill bit can sometimes be difficult.  Our Drilling Tips & Techniques section discusses the various starting methods. 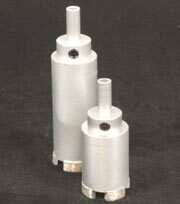 The Pro-Sintered Drill Bits over 1" in size are also designed to accept a Center Pilot Bit. The optional Pilot Bit is available below. If a Center Pilot Bit is used to start the drill bit, it is important to remove the pilot bit as soon as possible after the diamond drill bit has started drilling. 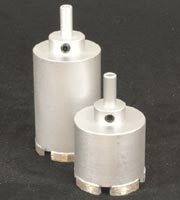 The carbide pilot bits cause the diamond bit to drill very slowly and the pilot bit can wear out quickly when drilling in very hard materials.